Barracuda's Advanced Threat Protection (ATP) combines behavioral, heuristic, and sandboxing technologies to protect against zero hour and targe ted attacks. ATP automatically scans email attachments in real-time; suspicious attachments are detonated in a sandbox environment to observe behavior. Barracuda Central responds to outbreaks as they emerge and delivers the latest definitions via Barracuda Energize Updates. These updates require zero administration and ensure that the Barracuda Email Security Gateway provides comprehensive and accurate protection against the latest Internet threats. Not every attack is focused on viruses, getting users to clicking on a malicious link. Often, the objective of the attack is focused on compromising or completely disabling a network. As a device that sits in front of an email server, the Barracuda Email Security Gateway is positioned to stop spammers before they overload an email server. The Barracuda ensures that email can still be delivered even during email server failures or loss of connectivity. In the event of on-premises disruptions, email can be spooled in the Cloud Protection Layer (CPL) for up to 96 hours. An alternate destination can also be specified if delivery to the primary destination fails. The Barracuda Email Security Gateway is integrated with the Barracuda Cloud Control (BCC) web-based management portal. Leveraging Barracuda�s global cloud infrastructure, organizations can centrally manage all their devices through a �single pane of glass� interface. Administrators have a global view of all their devices or services and can centrally manage policies and configuration. Just change your MX to point to our Barracuda Clusters and there is no hardware to purchase, and no equipment that you have to invest, its just as easy as 123. Pay as you go and on a per user basis. All hardware and network infrastructure is maintained by our Certified Support team. 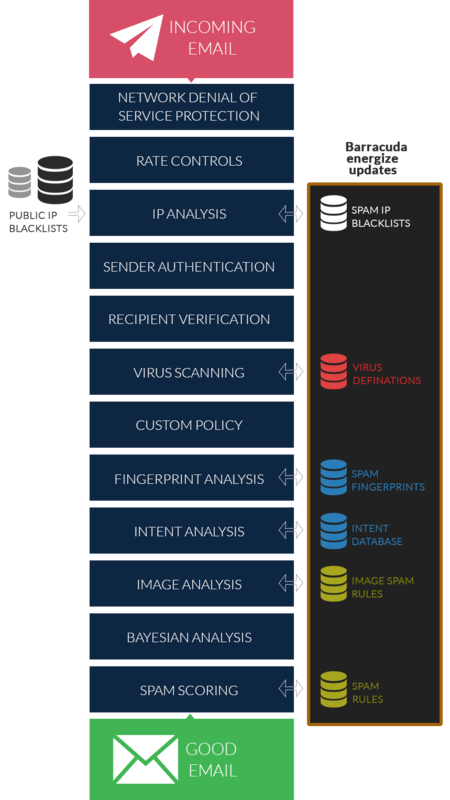 As a complement to the Barracuda Email Security Gateway, Barracuda Sentinel is the leading comprehensive AI solution for real-time spear phishing and cyber fraud defense. No contracts or commitment required, you can cancel anytime and the best part is our 60-Days No-Obligation FREE Trial. No credit card required.